What: A wide array of experts will present on substance abuse and prevention topics, including several youth presenters. EPIC Assemblies, the 2016 keynote, is a professional touring group of 12 elite and diverse young artists who bring a powerful message to youth from coast to coast. They blend their personal life stories with artistic expressions like dance, drama, original music, spoken word poetry, video and inspirational speaking. In the afternoon, fourteen teens from across Missouri will be honored with the 2016 Outstanding Youth Prevention Award. Getting Wasted vs Getting Hype! The EPIC Assemblies team will lead this session and share their personal struggles and experiences with drinking and alcoholism. They will dive deep into the reality of peer pressure, relationships and the effects of underage drinking. This session will allow time for Q&A and will leave participants with real-life knowledge and the will power to stand up and speak out against underage drinking, as well as encourage their peers to do the same. We ask that each participant only attend this session one time. EPIC Assemblies is leading the industry as the premiere school assembly program in the United States. Our organization has been conducting school assemblies since 2002, and have tested and proven what works with students. Over the past two years of touring nationwide, EPIC Assemblies has impacted over 65,000 students by partnering alongside superintendents, principals, teachers, counselors and community leaders and we are seeing thousands of lives changed around the country. EPIC (Empowering Performances Impacting Communities) is a team of 11 young adults who use their talents, as well as their real-life stories, to address many of the things that teens struggle with each day. Our intense and captivating production addresses bullying, alcohol and drug abuse, broken homes, mental health issues like depression and suicide and more. Our passion is to inspire students to talk about their struggles with trusted people instead of turning to destructive behavior and lifestyles. EPIC Assemblies inspires students to TAKE OFF THE MASK and make positive life changes! Using the arts in a creative and compelling production of the cast’s real life stories, the team “takes off their masks” as they address an array of topics, including substance abuse, bullying and suicide. The potential legalization of marijuana is a pressing reality Missourians must face. With only a month to go before we find out whether or not marijuana will show up on the ballots this fall, now is the time for action. Join us in this presentation to learn more about the ballot initiatives and how you can rally your community members to work towards halting the pro-marijuana campaign. Presenter Zach Thornhill, a three-time national debate qualifier, will also discuss how to respond to difficult questions you might receive from audience members who are familiar with the pro-marijuana rhetoric. You’ll leave this presentation with the materials and knowledge you need to begin or advance a grassroots campaign to inform community organizations about the harmful effects of marijuana and what its legalization would do to our youth and our community. Zach is a senior at Lee’s Summit West High School. He is a member of the coalition Lee’s Summit CARES in Lee’s Summit, Missouri. Zach occupies his time at school in IB classes, debating, playing football, shooting trap, singing in concert choir, and overseeing the German Honor Society as its president. He is a three time national debate tournament qualifier and a state football champion. Outside of school Zach enjoys hunting, fishing, trapping or anything outside. He also enjoys watching sports, especially the Kansas City Royals, with his friends. Zach plans on attending the University of Nebraska-Lincoln in the fall. There he will continue his debate career and pursue a major in the field of criminal justice before attending law school in order to become a prosecuting attorney. 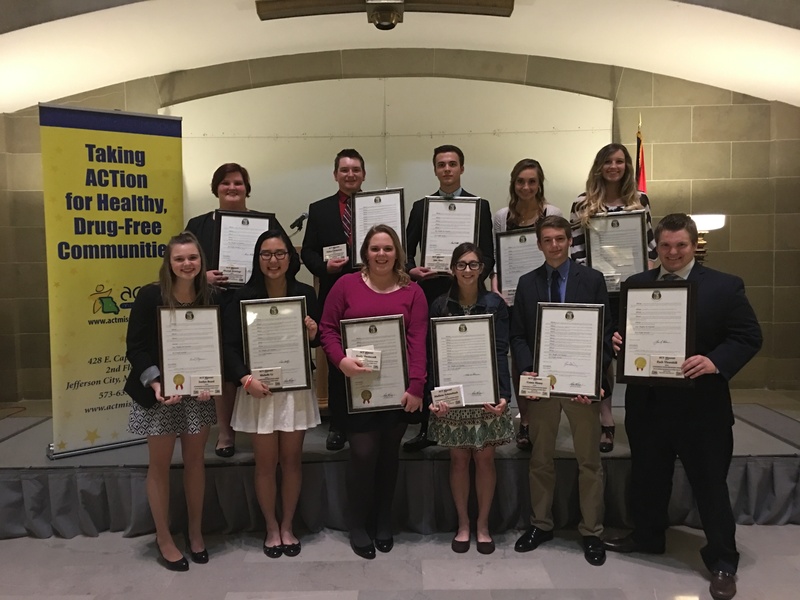 Each year, ACT Missouri recognizes several outstanding youth in the field of substance abuse prevention. Nominations came from coalition members, teachers, school personnel, coaches and community members. The recipients of the award demonstrated outstanding integrity through the student’s involvement in school, extra-curricular and community activities. Jordyn Beard Jordyn is a sophomore at Smithville High School. She is the co-chair of Clean Air Kearney as part of the local Smithville Community in Action (CIA) working on the community drive of Signature of Support. She serves on the state wide Tobacco Free Missouri Council as the Chair for Advocacy for smoke free policy group. Jordyn is working on program development for upcoming statewide Clear Mo Air: It’s Time for Action Rally that will be held in Sikeston and Jefferson City. She is working on program materials that will enhance our Clear MO Air youth advocacy trainings. She attends bimonthly conference calls where the Tobacco Free MO group discusses goals, objectives and advocacy issues for the statewide program. Through SADD, she got students to sign a safe driving contract for the ""It Only Takes One"" program during lunch. She will also be the chairperson for our SADD spring blood drive in April. Dylan has also joined the newly formed coalition, Dallas County Live Well Alliance and is a youth representative. Jordan Elder Jordan is a sophomore at Park Hill High School. As a leader of Youth With Vision, Jordon received numerous accolades, for the group, as well as for herself. She, personally was recognized by the state (ACT Missouri) by giving her a youth advocate award. She received a Presidential Service award for YWV, a Clay County Community Health in Action award for their Nicotine is Nicotine (educating on the harm of smokeless nicotine products, such as e-cigs, vapes and hookahs) campaign and, in November, attended the State Prevention Conference in which she accepted the Coalition of the Year award for the many programs and advocacy work that this group has accomplished. Perhaps one of the greatest and most recent achievements has been her work done on tobacco issues. As an incredibly well-spoken youth, she was selected to represent YWV at a major press conference regarding increasing the age of tobacco sales from 18 to 21 in Kansas City. It was her presentation that aired on major television news stations as well as her quotes that appeared in newspaper articles, not the six adult experts that also spoke. Her words and passion served as a catalyst for the city council passage of that ordinance. Jordan has also created numerous PSA's (audio and video) for campaigns and programs through her local coalition and high school on various prevention topics. She has won State and National Broadcasting Awards for these pieces. Samantha Gunn Samantha is a Junior at Calvary Lutheran High School. She is a Youth Ambassador for the 2015-2016 year, as well as her chapter’s SADD President. She has been a member of SADD since 2013, and has attended Speak Hard for the last two years. Samantha was a Video Contest Finalist for the Council for Drug Free Youth video contest in 2015. She believes that by promoting prevention, she can make her community a better place. Margaret Katherine (Maggie)	Helderle Maggie is a senior at Hazelwood East. Maggie is in Student Council, is a Disney Dreamers Academy 2016 graduate and has attended Speak Hard 3 times (2016 will be her 4th time!) and has been to the NCADA Prevention Leadership Conference twice. Conor Henry Conor is a Senior at North Kansas City High School. As a leader of Youth With Vision, Conor received numerous accolades, for the group, as well as for himself. 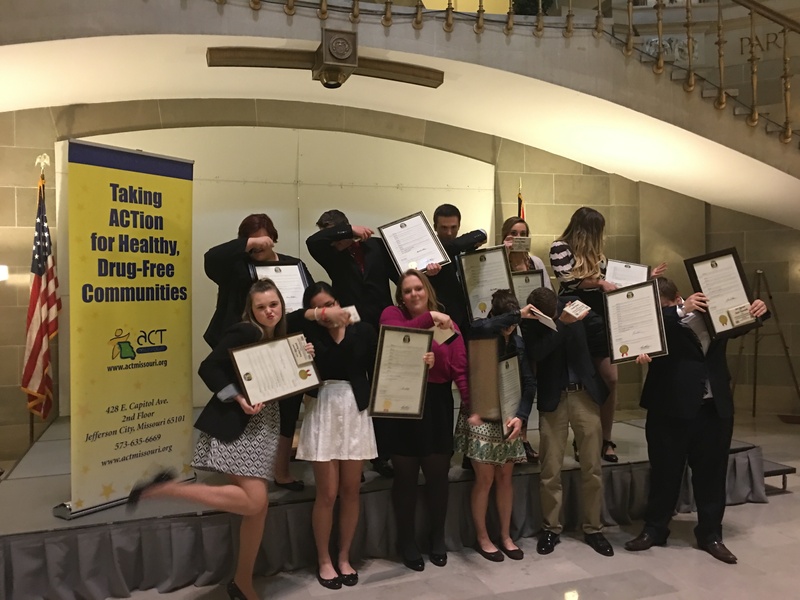 This past November, he attended the state’s prevention conference, accepting the Missouri Coalition of the Year award, on behalf of YWV, for the many programs and advocacy work that this group has accomplished. Under his reign, YWV also received a Presidential Service award and a Clay County Community Health in Action award for the Nicotine is Nicotine campaign. Conor was also instrumental in helping to form a community prevention coalition in his area- North Kansas City Teaching & Reaching Youth (NKC TRY). Michelle	Li Michelle is a Sophomore at Marquette High School. She serves on the Executive Board of the Rockwood Drug-Free Coalition as the only student member of the board. She is active in her SADD Chapter and is a regular attendee of Speak Hard. She has accepted a position as an intern at the Teen Institute. Madeline Mills Maddy is a Senior at Lawson High School. Maddy has been active on her local coalition, as well as the Youth Advisory Council for her local coalition. She has helped in leading prevention efforts through campaigns with her high school SADD group for the last 4 years. Maddy is not afraid to speak out for what she believes is best for her peers, and even testified at the hearing for HB 1786 during Prevention Day. Lizzie Oxley Lizzie is a Junior at Calvary Lutheran High School. She currently serves as the SADD Vice President and as a Youth Ambassador. She is passionate about preventing alcohol abuse in her community. Lizzie has held many leadership roles in her school, including the Co-Chair of the Speak Hard Activity, It Only Takes One, Safe and Sober, Red Ribbon Week, Suicide Awareness Week, and Back-to-School Dance. Jake	Rice Jake is a Sophomore at Dexter High School. Jake is involved in Missouri Smoke Free on the local, district and state level. He has attended Jake has attended coalition training meetings in Sikeston, as well as in Columbia. Jake has already spent hours of his own time to promote our program district and state wide! He is a council member of the district and state coalition as well as one of our leaders at Dexter. He has also attended the Stoddard County Smoke Free Coalition meetings as well. Jake recently spoke to our local school board and gained approval to post No Tobacco signs throughout our school campus. Jake also attended the state rally in March at Jefferson City. Madison	Schmerbach Madison is a Senior at Lawson High School. Madison has written numerous prevention PSA's for Youth With Vision as well as her local Youth Advisory Council, and even for Parent Up. She is always the first to volunteer to help with events and campaigns, even with a full academic and extra-curricular schedule. Madison was influential in the passage of Tobacco 21 KC in Kansas City, Missouri, as well as the continuation of the Nicotine is Nicotine Campaign. She is also active on her school's SADD Chapter, leading prevention campaigns that include those that focus on smokeless tobacco, safe driving, and anti-marijuana. Emily Thomeczek Emily is a Junior at Helias High School. Emily’s primary prevention activities focus on tobacco. As President of the Tobacco Free Missouri Youth Council, Emily has been instrumental in several of our major projects this year, starting with the development of “Clear MO Air, youth advocacy training, Clear MO Air- It’s Time for Action Rally’s’ and Game On Youth Leadership Summit that will be held this summer. Emily helps to remind the other youth council members of upcoming calls, events, responsibilities and helps hold them accountable. Last, Emily presented a power point presentation during a webinar for Tobacco Free Missouri annual meeting. This past summer Emily had a chance to participate in Campaign for Tobacco Free Kids, National Youth Symposium in Washington DC, where she had a chance to discuss tobacco issues with U.S. Senator Clair McCaskill, and U.S. Rep. Blaine Luetkemeyer’s staff. She is also an active member of Helias’s SADD team by promoting good decisions. Zach Thornhill Zach is a Senior at Lee’s Summit West High School. Zach has been an exceptionally dedicated member of Lee's Summit CARES' Youth Advisory Board (YAB) for the past two years. He has attended every meeting/activity in his senior year despite his busy school/extracurricular activity and is an outspoken proponent for a drug-free lifestyle in his many leadership roles. During the 2015-2016 school year, Zach presented to Lee's Summit City Council regarding prescription drug abuse, is a member of Lee's Summit CARES' anti-marijuana speakers' bureau, was interviewed by his school news channel about the harmful effects of marijuana and will be presenting a session called Protecting Our Youth: Marijuana in Missouri at this year's Speak Hard. Join the ACT Missouri Youth Ambassadors as they share with you the building blocks to building a healthier, smoke free community. Receive a sample template to present to the city council, advertising ideas, and engagement strategies to ensure that your community thrives. The Youth Ambassador Program is designed to empower the youth of today to be the substance abuse prevention leaders of tomorrow. Through interactive exercises, comprehensive trainings, and targeted focus on community needs, the Youth Ambassadors develop materials and support regional centers and school programs to prevent substance abuse. Members of the high school Bully Prevention Team will share the methods and effectiveness of teaching and demonstrating bully prevention strategies with younger kids ages 8 to 13. The presentation will describe how a selected team of older students is trained and prepared to provide effective, interactive classroom presentations and skits with younger students. Components of the classroom presentation will be provided and discussed. Hannah, Chloe and Kobe are seniors at Rolla High School and have been presenters with the Bully Prevention Team for two years. They are all active in sports and other organizations at school and in the community. Jamie Myers is the director of Prevention Consultants of Missouri. He developed the Bully Prevention Team and has been working in the prevention field for over 25 years. Everyone longs for a home. We are born with a need for family, for security, and for a place in this world. My workshop will help you understand how to heal and help family relationships that are hurting. We will tackle how addiction breaks down all the members of the family, and we will work together on building each other up and forming healthy, happy relationships with your family. Addiction is a family disease, but hope is there. Addiction might tear down, but recovery can make family relationships even stronger than before! I am proof of that. This workshop will help you find your family again. Dana Bowman is an English teacher at both the college and high school level. She is also a writer and speaker on the topic of parenting and alcoholism, with publication in The Fix, After Party Magazine, Today’s Christian Woman, and many more. Her book, Bottled: A Mom’s Guide to Early Recovery, narrates her story from addiction to recovery with humor and honesty. Dana speaks often at youth and family events about addiction and recovery, and it is her life’s mission to help others find hope and healing from this disease.